World Wide Waftage - Wafting Through Our World Wide Travels with Ease, Joy and Simplicity: Back in Honolulu after a 21 minute flight from Kauai...Out and about for shopping, fun and food! Back in Honolulu after a 21 minute flight from Kauai...Out and about for shopping, fun and food! Crossing over a bridge in Honolulu. Please excuse the less than ideal photo which were taken with my phone when we left the camera behind to go shopping. 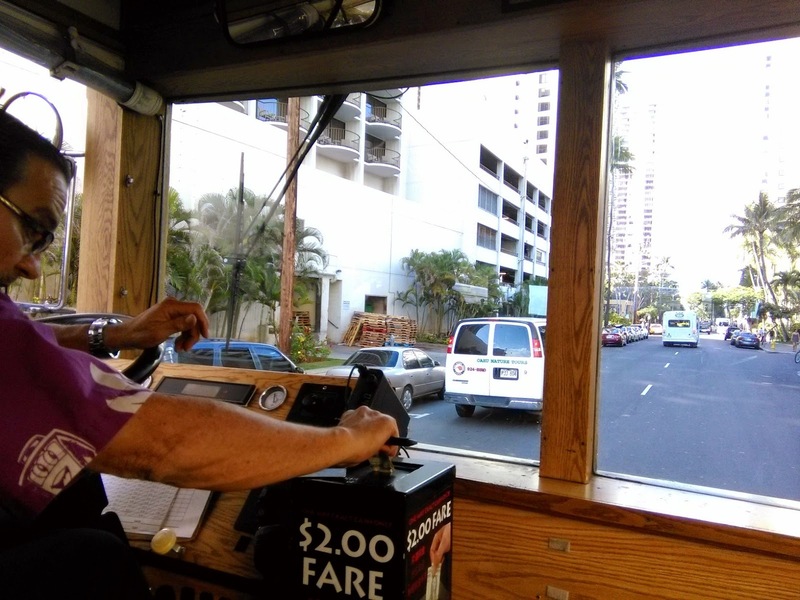 Yesterday, we left the condo at 10:30 am to drive to the airport in Lihue. As always, Tom drops me off at curbside with the luggage while I grab a skycap to take away our three prepaid checked bags while he returns the rental car. ﻿﻿﻿We've got this routine down pat for check in only. When we're leaving an airport, we haul the bags ourselves which we're able to do with me pulling the wheeled cart with all the carry on bags and wheeling the smaller of the three bags while Tom wheels the two heaviest bags. This way, we only have to pay for assistance part of the time. We took the Pink Trolley to the shopping mall in Honolulu. After the flight as we made our way to baggage claim, Tom suddenly realized he didn't have his driver's license in his pocket. Having to show it several times to board the plane, he kept it in his shorts pocket. When he realized he must have dropped it on the plane, he left me outside with the carry on bags while he ran back to see if it could be recovered. Losing his license would be a fiasco when at many ports of call, showing it is required to get on and off the ship. And, what about the rental car in Cairns, Australia which requires a driver's license? How would he get a replacement through the mail from afar? It was a dreadful thought. Again, "safari luck" kicked in. A kindly baggage agent ran to the plane moments before it was taking off again to recover the license, refusing to take the generous tip we offered. The fare was $2 per person each way. 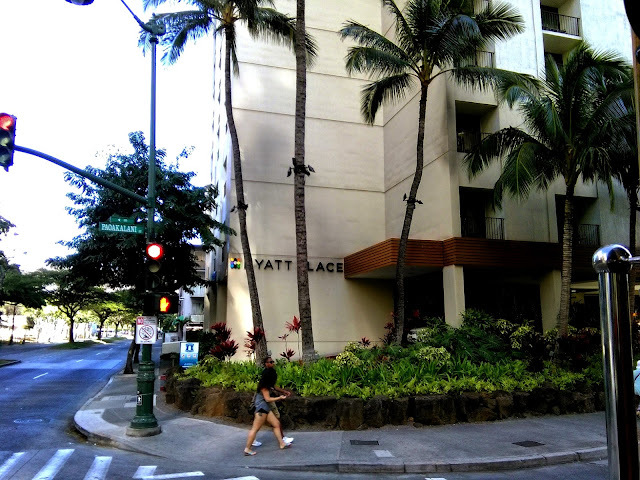 ﻿After the 25 minute taxi ride, we finally arrived at our hotel, Hyatt Place Waikiki by 3:00 pm. It hard to believe it took so long considering the short flight. Its all the "monkey business" in between that takes up the time, typical on every flight regardless of its actual flying time. The hotel room was small but conveniently outfitted with big screen TV, free wifi and a comfortable king bed. As I write this now, the Indy 500 just ended and before too long we'll check out and head to the pier. Having not seen the race in a few years while living outside the US, it was exciting to see how the presentation of the race has escalated with newer video technologies making it all the more exciting. Over the past several day I've been thinking about purchasing a pair of white pants to go with the many tops I purchased a week ago in Kauai. To avoid putting pressure on our time, I threw it out there as a possibility if time allowed. The exterior of our hotel, Hyatt Place. Yesterday, once we were settled in the room, I looked online and called Old Navy to see if they had white jeans in my size. With a few options in stock, Tom who despises clothes shopping agreed to go with me to the Ala Moana Shopping Center a few miles down the main road. Instead of spending $50 for the round trip taxi, we decided to take the Pink Trolley that travels directly to the mall and back. All we had to do was walk two blocks to the trolley stop in front of a hotel down the road. 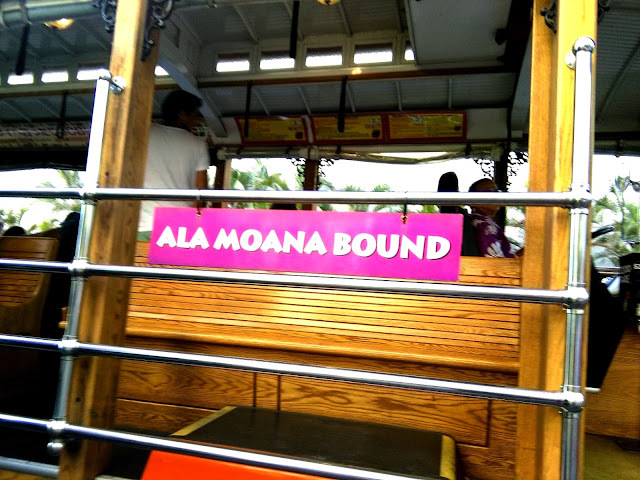 Within minutes we were riding on the open air Pink Trolley, thrilled that we'd decided to do this enjoying the scenery along the way. 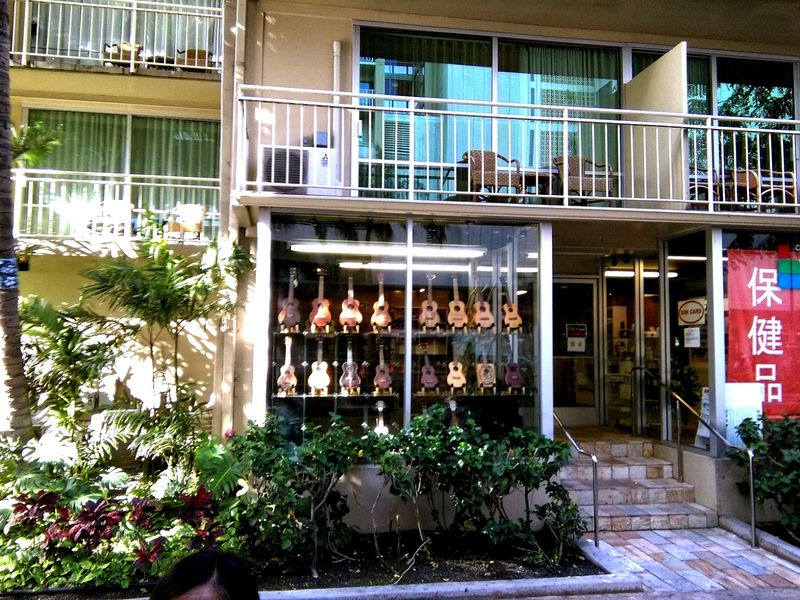 A ukulele store we passed on the ride. 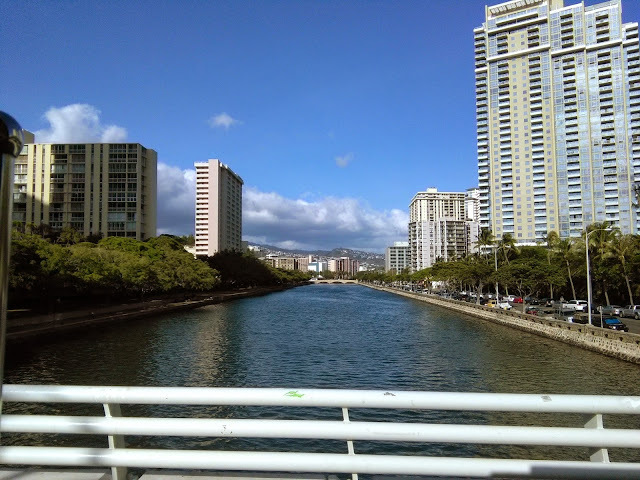 When we were in Honolulu/Waikiki last October for 11 days, we walked everywhere instead of taking the trolley. 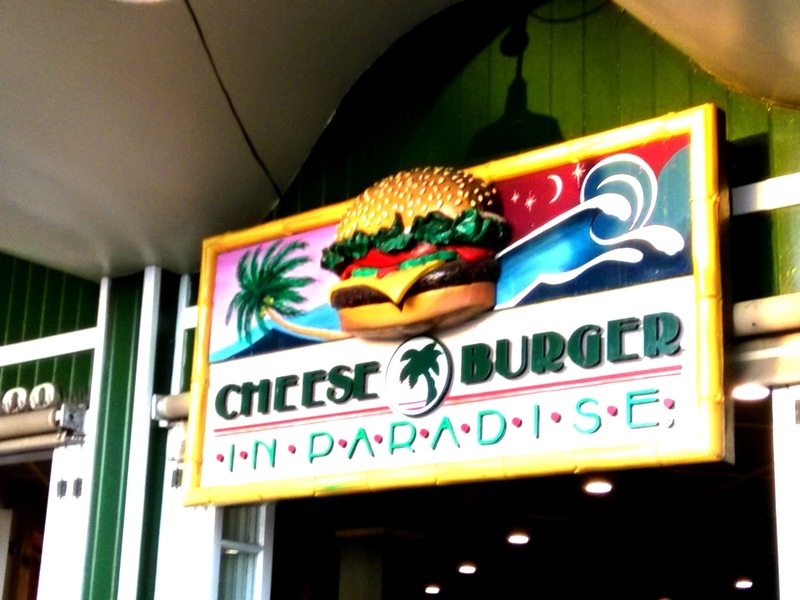 But, as the day wore on and wanting to have dinner at our favorite local restaurant, Cheeseburger in Paradise, taking the trolley ensured we could accomplish it all. And we did accomplish it all. Not only did I find a pair of white pants, modeling them for Tom while he sat in a chair in the fitting room, I was convinced I'd found exactly what I wanted when he smiled and gave me the thumbs up. I think that the first time Tom had ever been in a fitting room with me. 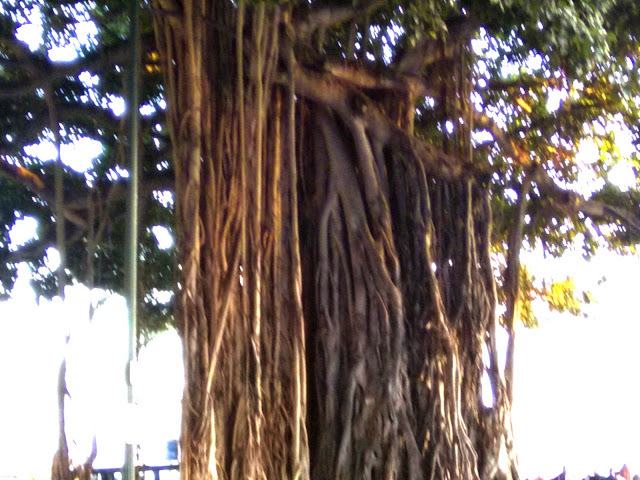 A blurry photo of a Banyan tree which line the boulevard in Waikiki. The only item I needed to complete my wardrobe for the cruises was a pair of high heeled shoes, preferably with a with a cork wedge type heel for added stability. Recently, tossing a pair of shoes, I was down to five pairs. I had no qualms about replacing the sixth pair with something new and attractive in light of three upcoming four up nights on the cruise. In no time at all we found the shoes and were back on the return trolley, getting off at the correct stop for the restaurant. It was 7 pm. All had worked out as planned, we had a great time and didn't have to wait more than a few minutes to get a table. The dinner was great as expected. I had my usual Cobb Salad and Tom splurged with a burger and onion rings. Before dark, we arrived at the restaurant for another great meal. By 11 am, we'll be checked out of the hotel and shortly on our way to the pier taking a shuttle arranged by the hotel for $17. Cruise check in begins at noon. Tomorrow, we'll be back with ship photos and more. Please check back then! A breathtaking view from our veranda of the private home we rented in Madeira, Portugal for two and a half month. We never tired of this view. For details from this date, please click here.